This is a generic sample of what the logos will look like to help you when making a selection in the "icon" drop down menu. All designs will be a combo of white, silver, royal blue and black glitter. Shirt color will determine color layouts. Your logo colors may change to be more pleasing on the shirt that you choose. Rhinestones will not be available on hoodies, or heavy weighted shirts as they will require more care. Short sleeved t-shirt, available in black, athletic gray, royal blue and white. Styles: Regular fit crew neck, lady fit crew neck, lady fit V-neck. Tri-Color Striped Tshirt (Long Sleeve) available in blue denim/charcoal/white or charcoal/gray/white. Oversized V-Neck Team Jersey available in royal, charcoal and black. Long sleeved crew neck tshirt. Available in black, athletic gray, and white. Female cut with non-elastic at wrists. Long sleeved crew neck tshirt. Available in black, athletic gray, hunter green and white. Male cut with elastic at wrists. V-neck, short sleeved t-shirt with white striped sleeves. 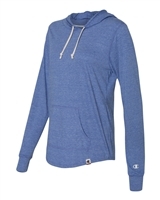 Hooded sweatshirt, available in black, athletic gray, royal blue and white.